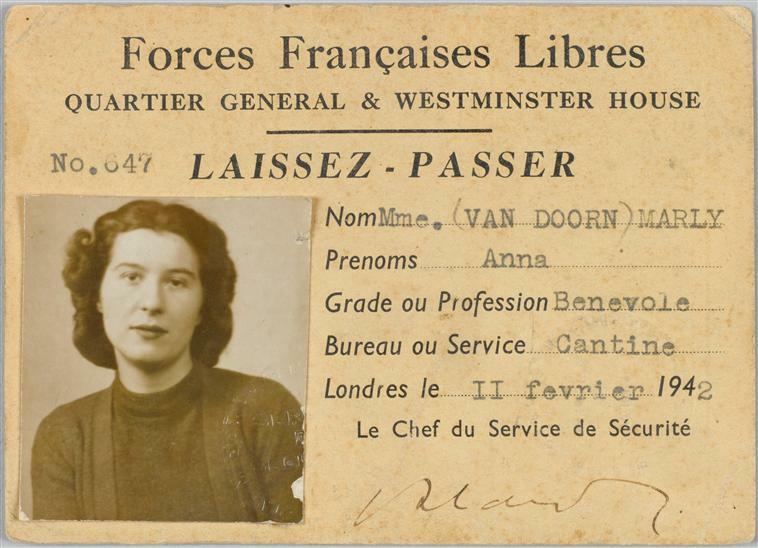 The Chant des Partisans song was created in the melting pot of wartime London, where different communities of artists, activists, and agents from all over the world mingled together. In particular, the song was the product of Slavonic and French exiles coming together for socialising and solidarity in the British capital. Indeed, the song was well travelled before it left London. Over the winter of 1942, the melody was written by Anna Marly (born Anna Betulinskaya, written Betoulinsky in France), a 25-year-old Russian singer and guitarist who had fled to London from Paris. Working in the canteen of the French servicemen’s centre in Carlton Gardens, Marly engaged with the French community in London. She performed in a number of venues, though notably at Le Petit Club Français, a small café at 13 St James Place (near the rather grander offshoot of the Parisian restauraunt Prunier’s). This network of social spaces for the exiled French is well explored in Debra Kelly’s chapter in A History of the French in London (available to read Open Access for free here). The Petit Club itself was just along from Carlton Gardens, De Gaulle’s wartime HQ, and also the French Intelligence Services. Such proximity led to a blurring between spaces of socialisation and action, and the personal relationships between exiled communities in London could help bridge connections to each other and to the British war effort. The restaurants and clubs of Soho and beyond often provided a juncture between one country’s politics and another’s military operations. It was at the Petit Club that Marly’s music was likely first heard by Emmanuel d’Astier de la Vigerie, one of the well-travelled leaders of Libération-Sud, currently in London. Proximity to the headquarters of the Free French was one thing, and proximity to the BBC was another. On 13 May, Marly was approached by André Gillois who was looking for a theme for a show broadcast by the BBC called ‘Honneur et Patrie’ (Honour and Country). Marly played six tunes on her guitar, and Gillois asked her to record two: Paris est à nous and La Marche des Partisans. Inspired by accounts of the battle of Smolensk, Marly had written La Marche des Partisans in the winter of 1942. The next day, they met at the studio in the presence of Emmanuel d’Astier de la Vigerie. While Marly played guitar, d’Astier and Gillois whistled the opening bars of the song, as the professional musicians on hand were too clean sounding ‘to give the impression of clandestine fighters whistling as they marched along the road’. After the first broadcast of Honneur et Patrie on 17 May, these whistled opening bars would become one of the songs trademarks, and also a signal used by resisters. As Maurice Druon later related, he had heard of Alsatian passeurs whistling the tune as an ‘all clear’ signal in the forbidden zone. Tasked by d’Astier with crafting an anthem, Kessel retreated to somewhere that was clearly a good spot for him to think, the Ashdown Park Hotel in Coulsdon, Surrey. The hotel was run by a chef who had worked at the Savoy, which meant that the food was French, and Kessel found it a welcome retreat from the air-raid sirens and bombardments which shook his Pall Mall apartment. He also signed off his famous novel Army of Shadows as being written at ‘Coulsdon, Ashdown Park Hotel, September 2, 1943.’ The song’s shift to the suburbs, south past Croydon to Coulsdon, saw it traverse another space in which exiles met. Croydon had been home to a “small colony of City Frenchmen” since after the Great War, and the commuter belts of Surrey were home to over 1,800 exiled French. Further, Yves Courriere names some of the habitués at the Ashdown: Antoine Bissagnet and Claude Hettier de Boislambert (both returned to London in January 1943 having spent time trying to promote resistance in Africa and subsequently in captivity), General Guy Bucheron de Boissoudy, “François Baron and the communist deputies”, and Fernand Grenier, the London representative of the PCF to the Free French. So, on 30 May 1943, Kessel spent what was likely a wet Sunday afternoon with his nephew Maurice Druon at the Ashdown Park Hotel, drafting the lyrics to accompany Marly’s melody. Tapping with two fingers on a badly-tuned piano in the hotel, Druon (apparently more musical then his uncle), set the pace while the words came quickly to the pair. That evening, Kessel and Druon met at d’Astier’s home, along with Anna Marly, the actress Germaine Sablot, and other prominent resistance figures. Marly performed the song for the first time to wide acclaim and, as Druon put it: “We wrote the words in an afternoon and that evening in the West End we tried it out on the men: they loved it.” It was agreed that Sablot would record the song the next day for a film being made by Alberto Cavalcanti, called Three Songs of the Resistance. The film was likely only seen after the Liberation, and Sablon would later perform the song for the “1st Division of the Free French and the 8th Army in the Libyan desert, and at the Opera of Algiers on the occasion of a visit by de Gaulle.” Yet, in the days following Marly’s first performance in d’Astier’s home, the song was carried mostly in the hearts of those that had heard it. Its transmission was a slower affair beyond the whistled tune on Honneur et Patrie. 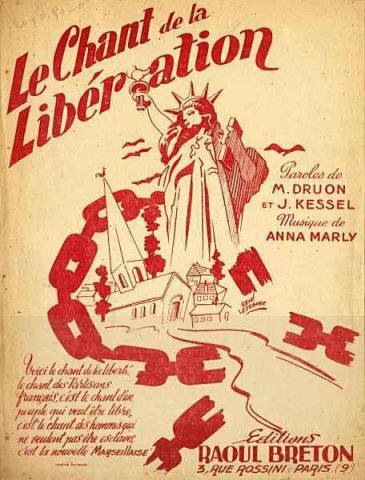 Throughout June both Marly and Sablon would continue to perform the song for Free French audiences in London, though it would take another month to arrive in France. 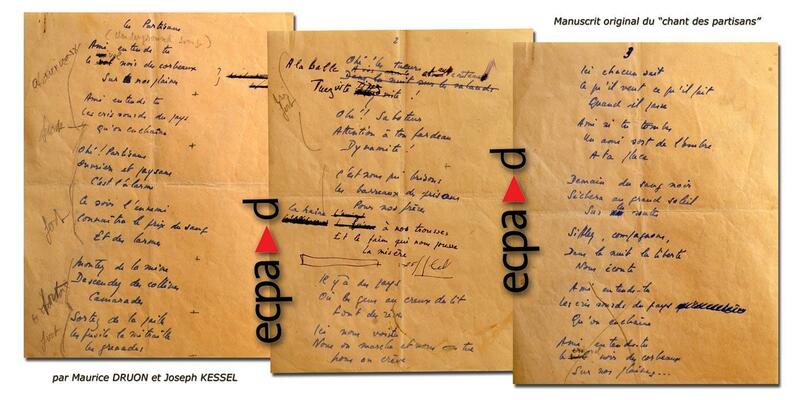 The original hand-written lyrics of Le Chant des Partisans were taken by hand to France on 25th July 1943. 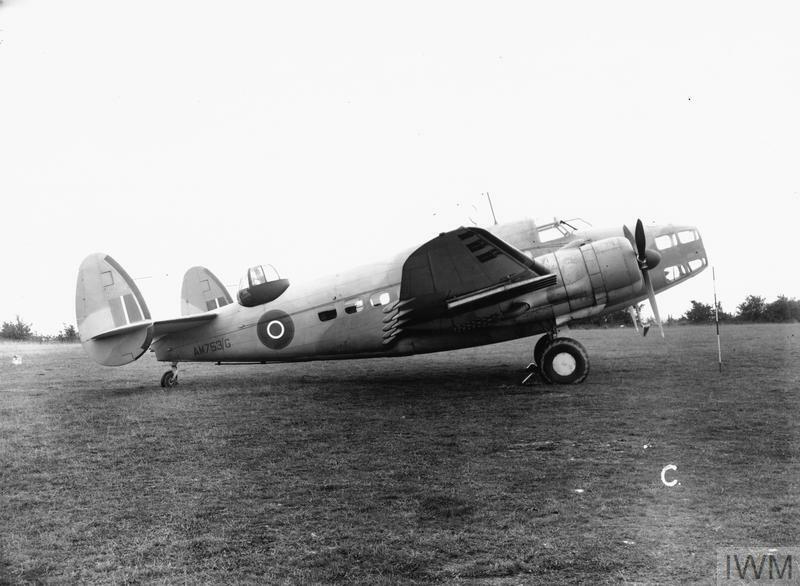 This made use of the RAF Special Duties squadrons based at RAF Tempsford (with a forward base at RAF Tangmere) which supported resistance on the continent by dropping agents, packages, and more (for more on these, see my article here). In this case, a mission entitled BUCKLER, delivered the lyrics and two important resisters to a landing site just east of Lyon codenamed ‘Figue’. The Lockheed Hudson (N7221) was flown by Squadron Leader Hugh Verity, with Squadron Leader Phillipe Livry-Level navigating and Sgt. Eddie Shine operating the wireless. Verity identified the ‘Joes’ (or agents) being flown over as Emmanuel d’Astier de la Vigerie and Jean-Pierre Lévy. After arriving near Lyon, d’Astier and Lévy set to work the damage following Jean Moulin’s arrest in Caluire, on 21 June 1943. Moulin’s work in bringing together the Conseil National de la Résistance only a month earlier had set the foundations of a unified resistance and brought closer the promise of Liberation. In this crucial period, d’Astier’s clandestine paper, Cahiers de Liberation, printed the lyrics of the song under the title Les Partisans (Chant de la Liberation) in September 1943. The song would be broadcast by the BBC throughout the summer of 1944, as it became an anthem of Liberation. It played on 6 June 1944 following De Gaulle’s BBC address announcing the D-Day landings, and it played on 19 August during the Battle of Paris. Thereafter, it became 75 years after the lyrics of the song were taken to France, it lives on as an anthem of the Republic, and an enduring symbol of wartime resistance. The song took flight from reports of the Eastern Front in late 1942 via London clubs and a Surrey hotel in 1943, to Occupied France and then in the Summer of 1944, as the jubilant strains of Liberation. D Kelly, ‘Mapping Free French London: places, spaces, traces’, in A history of the French in London (2013) 300-301, 329. Met Office Monthly Weather Report, May 1942. Accessed from [https://www.metoffice.gov.uk/learning/library/archive-hidden-treasures/monthly-weather-report-1940s], on 24/07/18. H.R. Kedward, “Mapping the Resistance: An Essay on Roots and Routes.” Modern & Contemporary France 20, no. 4 (2012): 491–503. H. du Boisbaudry & P Verdin, Maurice Druon: Le partisan (Paris : Cerf, 2016), Chapter One [electronic access]. André Gillois, Histoire secrète des Français à Londres de 1940 à 1944 (Paris: Hachette, 1973), 397. H. Schofield, ‘French knight set for Queen audience’, BBC News, 05/04/2004. Accessed from [http://news.bbc.co.uk/1/hi/world/europe/3599837.stm] on 24/07/2018. J. White, London in the Twentieth Century: A City and its People (London, Viking, 2001), 105; N. Atkin, The forgotten French: Exiles in the British Isles 1940–44 (Manchester: Manchester University Press, 2003), 190. H Verity, We Landed By Moonlight (Manchester: Crécy, 2005), 104.